Evaluated as espresso. Richly sweet, cocoa-toned. Cocoa powder, date, magnolia, molasses, oak in aroma and small cup. Satiny-smooth mouthfeel; resonant, chocolaty finish with notes of magnolia and oak. In three parts milk, floral tones are amplified, and cocoa notes are integrated with roasty-sweet aromatic wood. Decaffeinated at origin using ethyl acetate, a natural solvent derived from sugar cane. 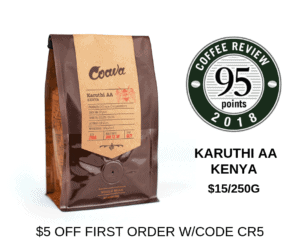 Espresso Republic, founded in 2010, specializes in sourcing quality coffees and roasting them in small batches for both retail and wholesale customers. Visit www.espressorepublic.com for more information. The Bottom Line: A solid, straightfoward decaf espresso from Colombia, especially chocolaty in cappuccino-scaled milk.